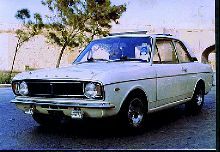 One of the most interesting of all British saloon models from the 1960's first appeared in 1963, the Lotus Cortina. 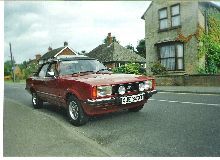 This very special Cortina was the fruit from an interesting partnership between Ford (UK) and Lotus Cars of Norfolk, England. 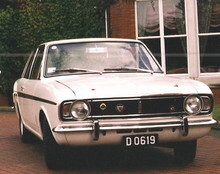 A stiffened two door Cortina shell was used as a base with a Lotus 1558cc, twin-cam engine providing 105bhp. Servo assisted disc brakes, lowered and revised suspension ensured that the Lotus Cortina handled as well as reaching a top speed of 108mph. Wide road wheels and tyres provided plenty of grip and the most distinctive feature, the special white paintwork with green side flash, made sure that the Lotus Cortina stood out from the crowd. In 1967 a Mk II Cortina Lotus superseded the earlier model and now came with a choice of body colour. Unfortunately some of the original spirit had been lost in the Mk I - to - Mk II change and so the following has never been as strong. 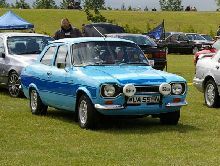 Production of this the last Lotus/Ford joint venture ended in 1970. 8' 2" 4' 5" 14' 0" 5' 5" 0 (18) 0' 0"